On Sunday morning, collective Keep It Complex will host a family-friendly brunch. A relaxed start to your Sunday morning, with great food and conversations, so you can digest politics. On Sunday afternoon, we will play politics. This is your chance to stand at the despatch box, glue on that Jeremy Corbyn beard or put on the Theresa May pearls. Together with writer Sarah Jury we have devised a parliament live action role play. 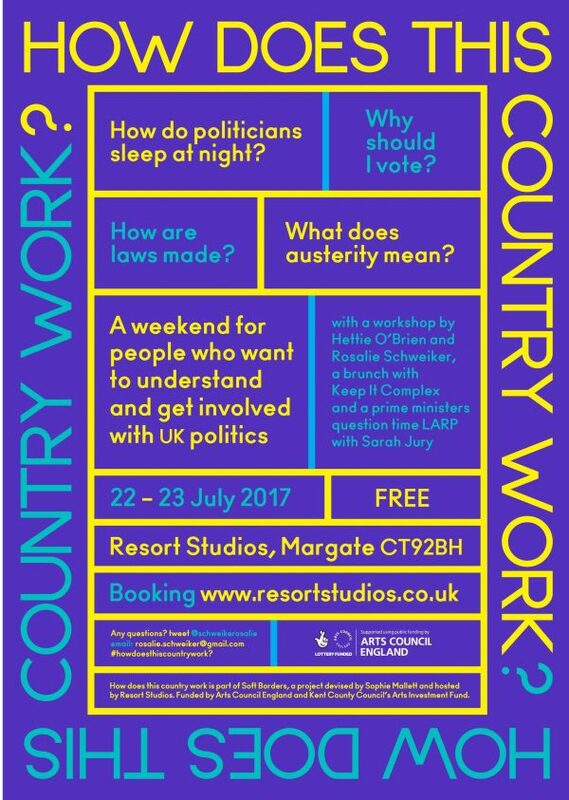 How Does this Country Work is part of Soft Borders, a project devised by Sophie Mallett and hosted by Resort Studios. Funded by Arts Council England and Kent County Council’s Arts Investment Fund. The Digesting Politics brunch is supported by an A-N artists bursary.